NSA Aijt Doval during his US visit met US Defense Secretary, Gen (rtd) James Mattis. The Trump Administration is seeking to deepen its counter-terrorism cooperation with India and expand it further, sources here said after National Security Advisor Ajit K Doval's high profile meetings with top US officials. 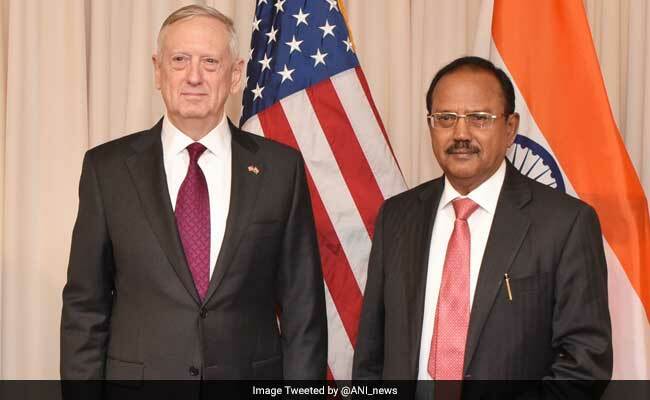 Mr Doval during his US visit this week met US Defense Secretary, Gen (rtd) James Mattis, Secretary of Homeland Security Gen (rtd) John Kelly, and National Security Advisor Lt Gen H R McMaster. In all these meetings, the common threat was expansion and deepening of India-US co-operation in collectively addressing the challenge posed by terrorism in South Asia. He also met Senator John McCain, Chairman of the powerful Senate Armed Services Committee, and Senator Richard Burr, Chairman of the powerful Senate Select Committee on Intelligence. "Mattis specifically applauded India's efforts to promote stability in the South Asia region. Both leaders reaffirmed building upon the significant defence cooperation progress made in recent years," Pentagon Spokesperson Capt Jeff Davis said in a read out of the meeting, adding that the two leaders discussed their role in cooperating to uphold international laws and principles. "Secretary Mattis and NSA Doval further discussed collaboration on a wide range of regional security matters including maritime security and counter terrorism. The two pledged to continue the strong defence partnership between both nations," Davis said. Mr Doval and Mr McMaster during their meeting at the White House on Thursday "committed" to work together as partners to "combat the full spectrum" of terrorist threats, affirming that both great democracies stand together in the fight against terrorism, a senior Trump Administration official said. "All the meetings were very warm, very positive, very constructive. 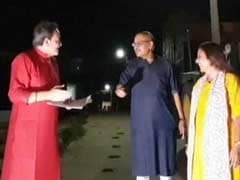 I think there is an open approach to India," Indian sources said as Doval concluded his meetings in Washington DC yesterday. This was Mr Doval's second trip to the US after Trump won the presidential elections in November. In December, Mr Doval had met NSA-designate Gen (rtd) Michael Flynn, who resigned a few weeks after he took over the job due to the controversy surrounding Russian diplomats during the transition and election campaign. Mr Flynn was quickly replaced by Mr McMaster, who according to the officials, has a very positive view about India. "The discussions (in all these meetings) covered India's economic plans, reforms, growth. They covered our core security concerns, regional concerns, defence and security aspect of the India-US engagement," the senior official said on condition of anonymity. For instance, the meeting at the Pentagon covered India-US defence relationship, issues like maritime security. "Naturally the challenge, nature and manifestation of terrorism and co-operation with regard," the official said, adding that the sense from these meetings came out that the Trump Administration seeks to take forward the upward trajectory of this bilateral relationship. With Homeland security, issues of radicalisation, cooperation in border controls, issues of information sharing which can help fight terrorist sides popped up. The Trump Administration officials were interested in hearing from Mr Doval on New Delhi's views in the region, in particular Afghanistan and vice versa, informed sources said. In some of the conversations, issues like demonetisation and Goods and Services Tax (GST) also popped up, reflecting the close interest that the US has in the economic growth of India. There was no specific discussion on Pakistan, but it figured in the context of terrorism in the region. Inside the Trump Administration leadership, it is clear how this Indian neighbour is closely associated with terrorism, the official said.